This is the sky of the Earth. The vault of heaven, which in reality envelops us in a dark velvet sphere spotted with stars, is seen here projected onto a plane. This improbable 360-degree panoramic image, covering the whole of the vault of heaven, embodies thus the cosmic landscape in which our small blue planet is immersed. A landscape that unfolds progressively, one season at a time, while our planet follows its perpetual course around the Sun. This image was created in the framework of the International Year of Astronomy (IYA 2009), with crucial help from the European Southern Observatory (ESO). The images were collected from two exceptional astronomical sites, the Atacama Desert in the southern hemisphere and the Caldeira de Taburiente in the Canary Islands in the northern hemisphere. It is the sky that everyone can relate to that I wanted to show — its constellations, its thousands year old stars, whose names have nourished all childhoods, its myths and stories of gods, titans, and heroes shared by all civilisations since Homo became sapiens. The image was therefore made as man sees it, with a regular digital camera. 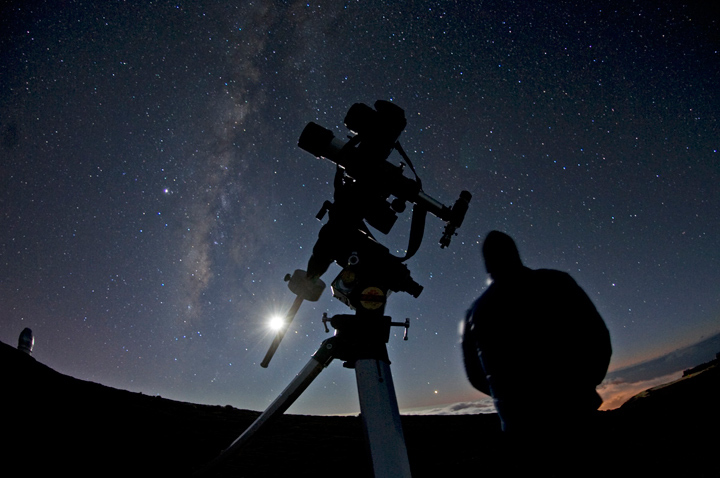 While photographing, in between the northern summers of 2008 and 2009, solar system’s objects invited themselves into the stars’ infinite ground: blinding planets Venus, Jupiter and Saturn, as well as the more discrete and farther Uranus and Neptune; even a comet with a emerald green brilliance, lost among tens of millions of stars, and that you will have difficulties finding. The Sun and the Moon are of course missing in the picture. Because to capture the light from the stars, one needs to perpetually turn one’s back on the two brightest luminaries in the sky. 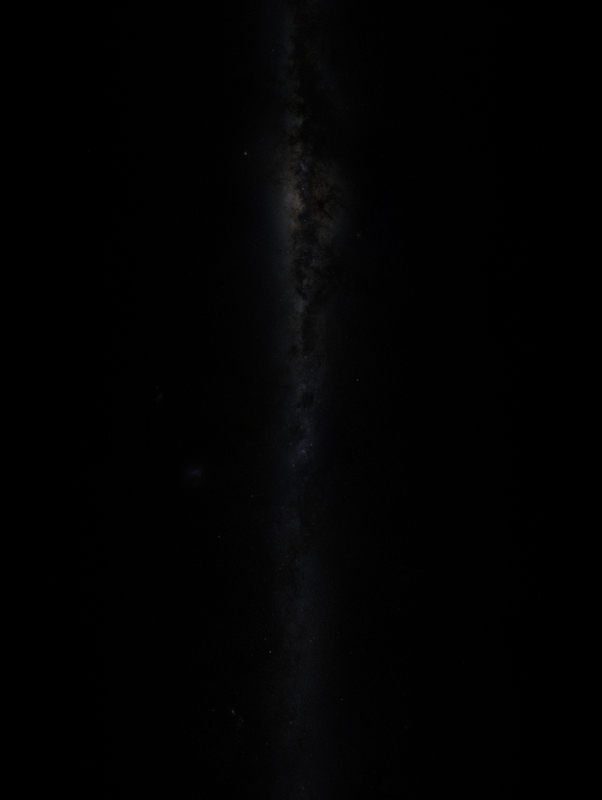 The Milky Way is the most imposing view in this sky representation. The chosen projection, in galactic coordinates, puts us in front of our Galaxy, which we discover as if we were looking from outside. The general aspect of our spiral galaxy, with its thin disc, harbouring young stars and marbled with dark or bright nebulae, its central bulge, its satellite galaxies, is easily recognised. According to the last stellar census made by astronomers at the Besançon Observatory, the Milky Way contains about 150,000 million stars. Less than 0.0001% of these are visible here, and astronomers have, today, identified less than one percent of the total galactic population. Finally, the most important component of our Galaxy, the most fascinating to earthlings, is here invisible. I am talking about the millions of millions of planets that the Galaxy hosts, new worlds that stir our imagination. This image of the sky is in fact a mosaic composed of almost 300 fields, each captured four times, for a total of 1200 photos. All were taken with a Nikon D3 digital camera and its 50 mm lens open at f5.6. Each image is the result of a 6-minute exposure. The apparent motion of the sky, caused by Earth’s rotation, was corrected thanks to a small equatorial mount, moving in the opposite direction and making a whole circle in 24 hours precisely around the Earth’s axis of rotation. Here, the material used to photograph the sky is seen installed on the platform of ESO’s Very Large Telescope (VLT), at Paranal, in Chile. To carry through this project, I needed ideal observing conditions. 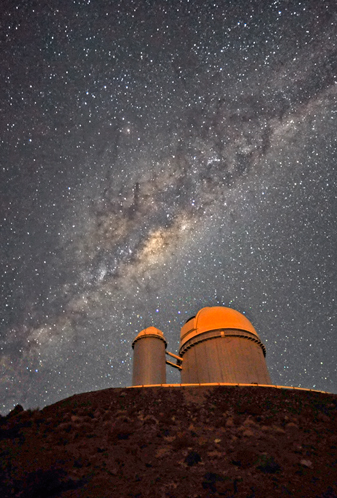 The European Southern Observatory gave them to me, inviting me to take most of the pictures from its observatories in Chile, located under the most pristine skies in the Atacama Desert. 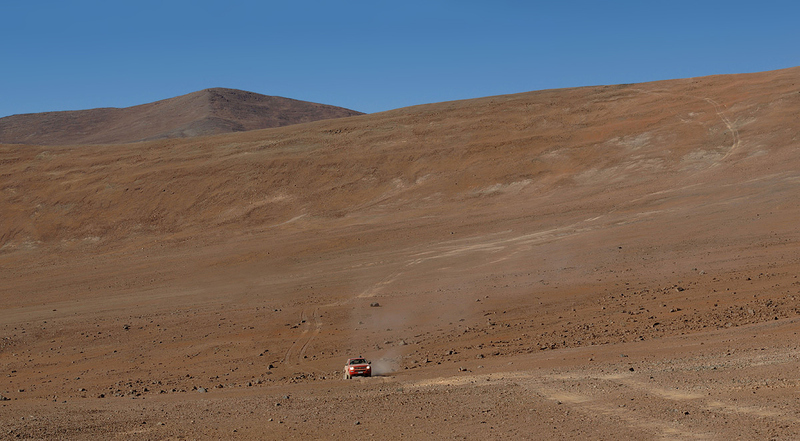 After having stayed several times at La Silla and Cerro Paranal, I wanted to enjoy this tête-à-tête with the sky in a more radical, intimate, and even overly close way, by taking images in the deepest parts of the desert. I wanted to get to the heart of the matter, the day and night cycle in the real desert, a cycle only regulated by the ballet of the stars during the night and the shadow games on the dry stones of the reg during the day. 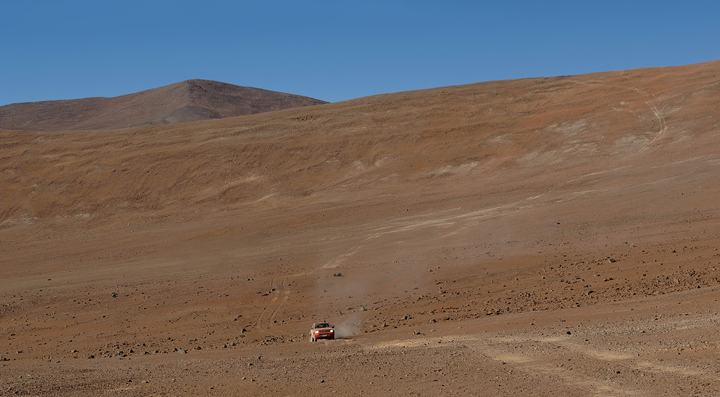 Equipped with the GPS coordinates of mount Cerro Ventarrones, I started my quest for this high site of astronomy, a 2600 metre high isolated mountain in the Atacama Desert and one of the possible sites for ESO’s future giant telescope, the E-ELT. At an altitude of 2400 m, below the northern side of Cerro Ventarrones, protected from the wind, I installed my material among the rocks. During the day, at the peak of the southern winter, the temperature climbs to more than 30 °C, while at night it drops well below -5 °C. The power for the camera came from the four-wheel car. For the Nikon D3, I held a set of three Li-ion batteries that I recharged regularly on the cigar lighter of the car, through a 12v/220 v converter. The ancient equatorial mount Perl Vixen GPDX was powered thanks to a set of eight 1.5 V batteries, which had an almost unlimited lifetime. The mount could rotate all night, for a whole week, unperturbed. Once the images were taken, I had to process them: to this aim, I used the Deep Sky Stacker image processing software in order to add the four images of each field. 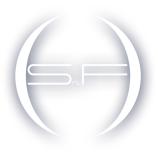 This numerical superposition allows reducing the electronic noise of each picture while increasing the signal from the stars. Once the project was on track, getting confronted to the “real starry sky” has been an endurance test, full of surprises, and much more difficult that I thought at first. The shooting took place in the traditional way: similarly to a sailor travelling by sight, I got my bearings in the sky, jumping from star to star. The first evening, I aimed the camera at the bright star Canopus, which was culminating south and was starting to set towards the west. The mount, locked in declination (the celestial latitude), was simply drifting in right ascension (the celestial longitude), but the most difficult part arose from the necessity to work at the zenith, or as close as possible to the meridian, in order to keep the same atmospheric thickness and so, a regular quality of the sky. The following night, I just had to aim at Canopus once more and to start over again the whole process, shifting slightly the star to the north. And so, night after night, from one stellar flagpole to another — Canopus, Sirius, Achernar, Alpha Centauri, Antares, Spica, Arcturus, Altair, Vega, Deneb... — the sky coverage progressively increased, stripe after stripe of the cosmic wallpaper. Once I had photographed the whole sky visible from the Atacama Desert, from 90 °S till 40 °N, I had to finish the work in the northern hemisphere. A small region of the sky, around the Polar star, was scanned from the Alpes-de-Haute-Provence, in France. There, not far away from the little town of Castellane, on peaks about 1500 to 2000 m high, magnificent, isolated sites allow one to observe the sky free from light pollution. 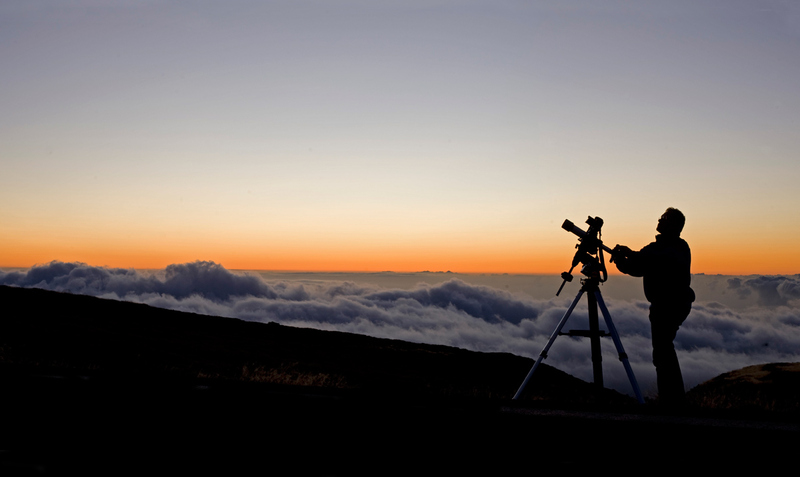 Finally, the remaining northern hemisphere was photographed from the Roque de los Muchachos, in the Canary Islands. On top of the Caldeira de Taburiente, 2400 m above sea level, the observatory emerges from the sea of clouds that covers the hillsides of the La Palma island. 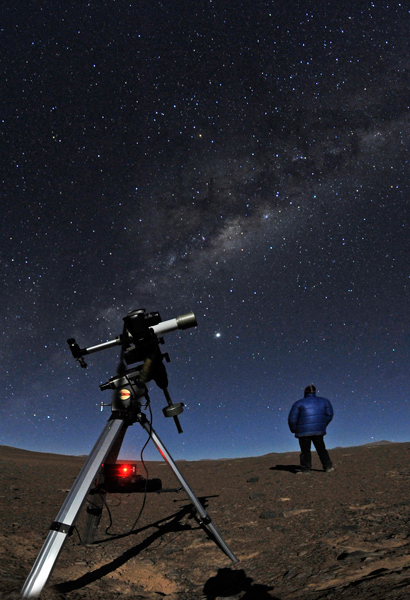 In the Atacama Desert as on the summit of the La Palma volcano, the nights followed, all identical one to another. Lying on the ground, at the foot of the telescope, rocked by the regular “bip bip” of the interval timer, I gazed at the sky, as the amazing stellar clouds of the Milky Way passed over me. From time to time, the “clac” announcing the end of an exposure woke me up, when it was not the chilling cold of the night. I lived in this way for almost thirty nights, in complete osmosis with my camera and the sky, and heard about 1200 times the “bip bip” announcing the next exposure… The total exposure time of this image is close to 120 hours. Meanwhile, from his Astro'n-Home in Longuesse, northwest from Paris, my friend Frédéric Tapissier was looking for the technical solutions to the stitching of these hundreds of celestial fields, amounting in total to about 15,000 million pixels, or about 20 GB of data. 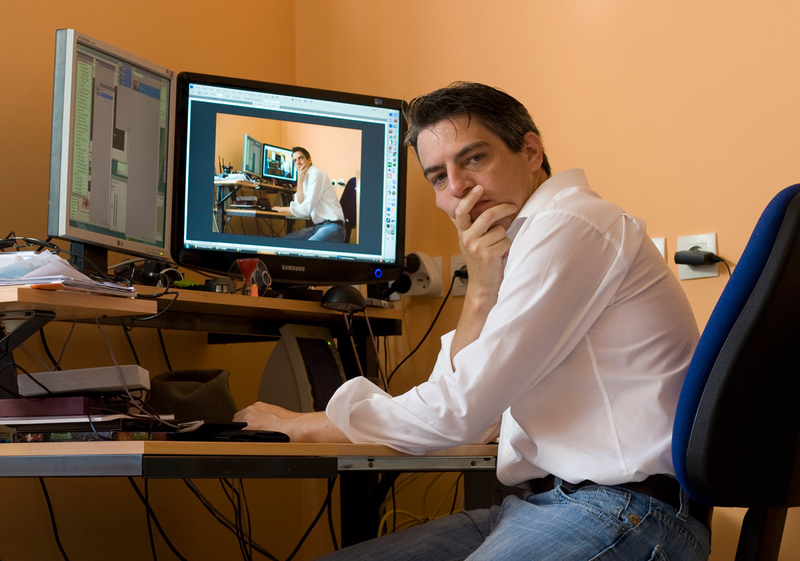 Finally, Frédéric found the solution, by choosing the new image processing software Autopano Pro Giga, which enabled the computation of the full representation of the heaven vault projected onto a plane, in “only” 340 CPU hours. The intermediate file produced by Autopano Pro Giga was as large as 145 GB. 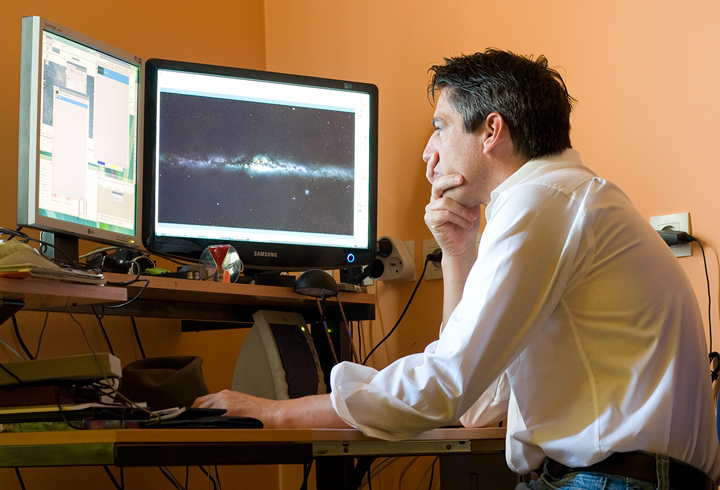 The final image contains 40,000 x 20,000 pixels, or 800 million pixels. It is 4.42 GB in size and is coded over 48 bits, representing more than 200 million millions of colours. While, month after month, the picture of the whole sky took shape, ESO became more and more involved into making this project a success. Astronomer Henri Boffin had the idea to further this endeavour, asking astrophotographer Stéphane Guisard to zoom into the centre of the Milky Way with a powerful hobby telescope and a CCD camera, from Cerro Paranal. 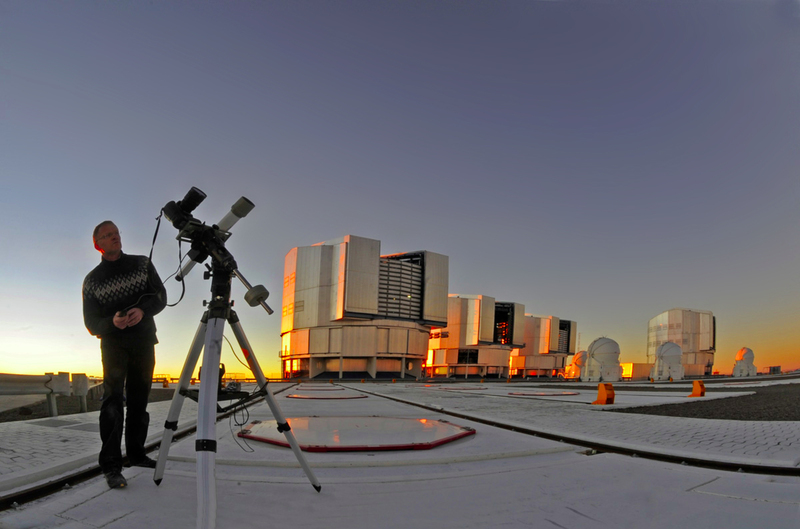 ESO also used for several nights the 2.2-metre telescope at its La Silla Observatory, which is equipped with a Wide Field Imager camera, to produce a further zoom into the image of Stéphane Guisard. The reward is the most breathtaking dive ever made into our Galaxy, a wonderful manner to link the sky seen by all with the cosmos of astronomers. 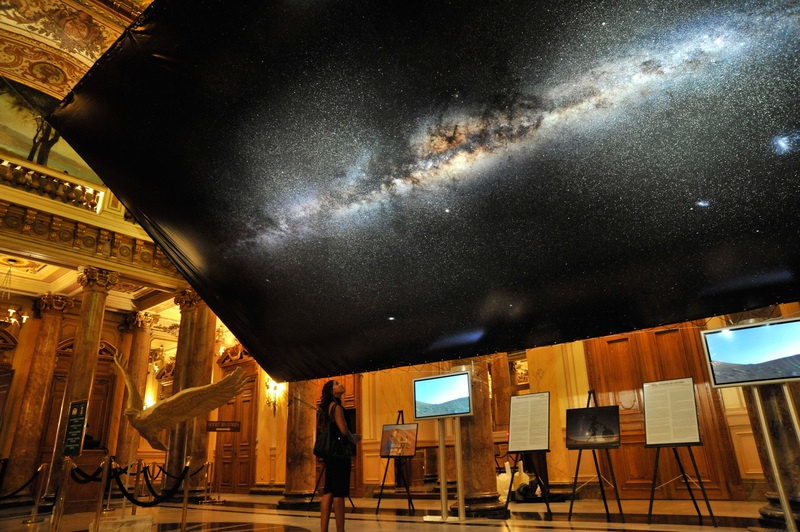 From the 25 th August to the 13 th September 2009, this giant picture of the entire sky is exposed in the « Un ciel pour une planète » exhibition, in the Atrium of the Monte-Carlo Casino, Monaco. The making of of the project is shown under a 12 m x 6 m picture. An exposition organised and proposed by the photo agency Realis, the Monaco's Lions Club, la Société des Bains de Mer and our official partner Kelibia la Blanche.